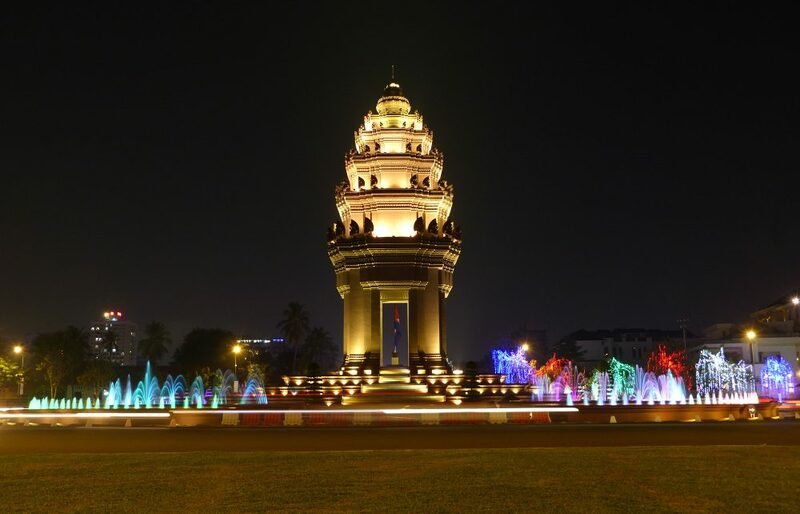 Despite being the capital of Cambodia, Phnom Penh is not particularly popular with visitors. Most will pass through as quickly as possible, aiming for the Angkor ruins or the coast. One person we met described a 'sadness' in the atmosphere, a lasting echo of the Khmer Rouge. We, on the other hand, were glad that we spent several days exploring this youthful and rapidly developing city. It gave us time to dilute the harrowing history of S-21 Prison and the Killing Fields with the vibrant enthusiasm of daily life here. 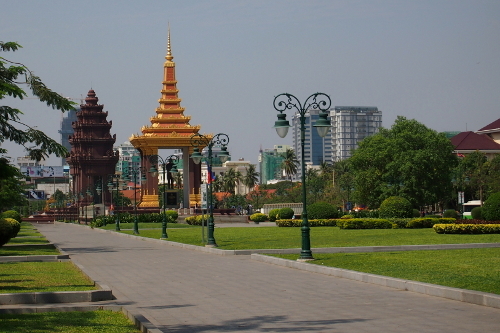 Wide pedestrianised boulevards run through the centre of Phnom Penh. During the day these open spaces are largely deserted but at night they come to life. It feels like the whole city congregates around the Independence Monument for an evening walk. Crossing the park one night, we made the mistake of going against the tide of walkers. We soon realised it was easier just to go with the flow. Elsewhere, we saw groups of teenagers busting out energetic dance routines and a large crowd engaged in an outdoor aerobics class. The first time we saw the aerobics group, most of them were wearing blue t-shirts. We thought little of it until we passed the same class a few days later. This time, nearly all of them were wearing orange. It was only when we visited the Royal Palace that the secret to this cultural quirk was revealed. The massive golden spires of Phnom Penh's Royal Palace are an impressive sight, visible long before you reach the palace gates. 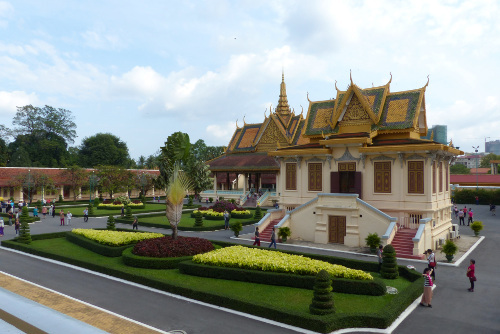 Much of this complex is open to the public though the royal residence, still home to the king, remains off limits. The centrepiece is the Throne Hall, used for coronations and other major ceremonies. However, like most of the other buildings, we could only admire it from the doorway. One of the few buildings we could enter was the Royal Museum. 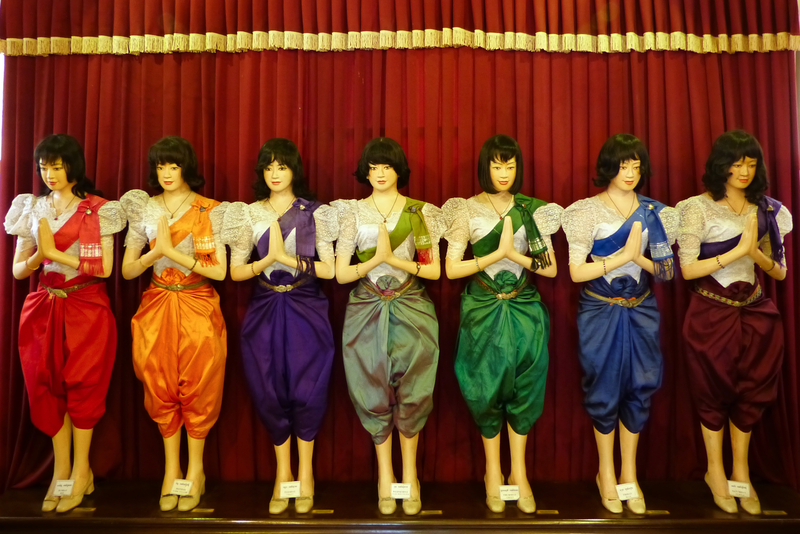 It was here among the assorted silverware, portraits and royal regalia that we discovered the secret of Cambodian colour coding. 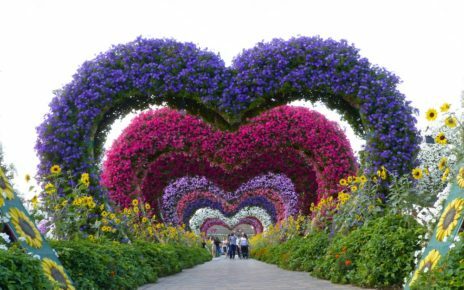 A different auspicious colour is assigned to each day of the week. Red should be worn on a Sunday whereas orange is the colour of choice for Monday. Although most Cambodians don't take this tradition very seriously, it does apply to important events and, apparently, exercise classes. Named for its silver floor, the Silver Pagoda is considered a highlight of the Royal Palace. Sadly the floor was almost entirely covered by a tatty carpet to protect it from stampeding tourists. 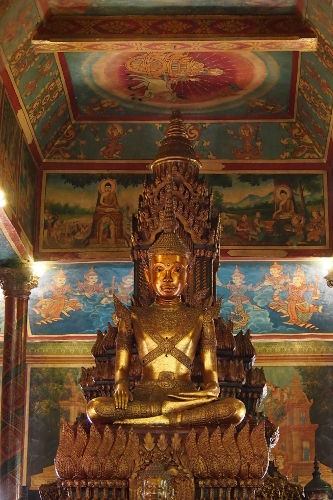 The most revered statue in the pagoda is yet another Emerald Buddha that isn't actually emerald. For us, the life-sized standing Buddha encrusted with diamonds cut a far more impressive dash. Armies of demons and monkeys rampage across the perimeter walls, fighting to the death in epic battles. 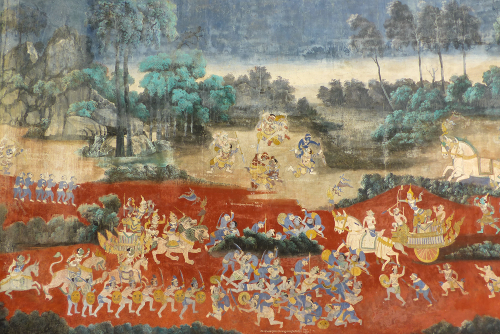 Paintings from Hindu legend are common in Cambodia and nearby Wat Phnom is covered with them too. 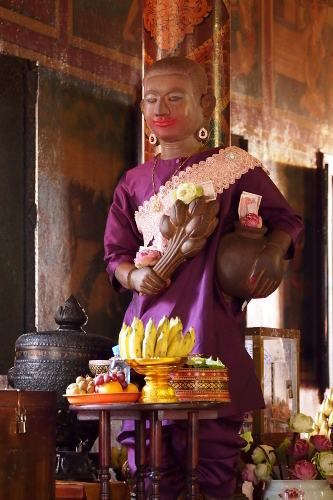 Legend has it that a woman named Penh found four Buddha statues washed up on the banks of the Mekong. She enshrined the statues on a nearby hill (or Phnom) and the city grew from there. 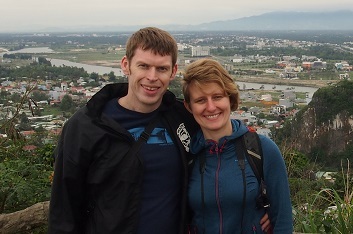 The temple of Wat Phnom now stands on this hill, overlooking the otherwise flat plain on which the city stands. Surrounded by a densely wooded park, the white bell shaped stupa emerges from the greenery. Inside, dozens of Buddha statues stand, sit or recline beneath a ceiling beautifully painted with yet more scenes from Hindu legend . Among the various statues, the one dressed in drag and smeared with lipstick particularly caught our attention. Other highlights of Phnom Penh however, reminded us of a recent and much darker history. Shortly after the Khmer Rouge relocated the population of Phnom Penh to the countryside, an abandoned school was crudely converted into the S-21 prison. Hearing stories from survivors enhanced the eerie atmosphere as we wandered through the former prison cells and torture rooms. We heard about the brutal treatment of the victims, forced to confess to crimes they didn't commit. Once they confessed, they were moved to the nearby Killing Fields for execution. Outside Phnom Penh lie the infamous Choeung Ek Killing Fields. This is the final resting place of thousands of so-called 'enemies' of the Khmer Rouge. Most were innocent civilians, wrongly accused of espionage. The memorial park is now so peaceful it's hard to imagine what really happened here. 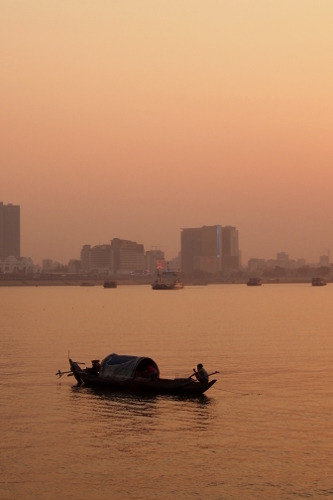 Phnom Penh stands on the confluence of the Mekong and Tonle Sap rivers. On our last night in the city, we joined a sunset cruise. Relaxing on the open deck with cocktails, we cruised along Phnom Penh's main waterfront before setting off across the river. On the far bank of the Mekong we took a closer look at a Cambodian water village perched precariously on bamboo stilts. Being there in dry season, the stilts seemed unnecessary but they are essential when the water levels rise later in the year. The river banks were a hive of activity in the evening sun. We saw fishermen casting nets, waist deep in the water, kids splashing in the shallows and others cruising past in narrow longtail boats. On the narrow wedge of land between the rivers, we came across the Cham fishermen's camp. A densely packed row of bright blue boats was moored on the riverbank. On the shore, a handful of tents stood on the mud amid piles of discarded rubbish. 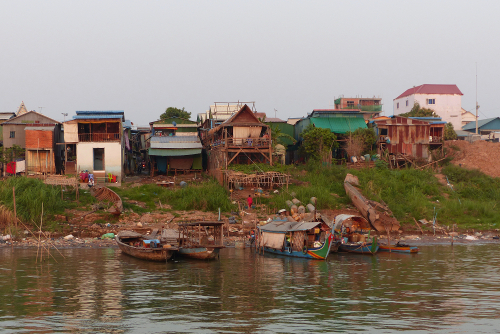 We saw whole families living together on these tiny vessels in an otherwise abandoned corner of Phnom Penh. This minority group was particularly brutalised by the Khmer Rouge. Although they now enjoy the same legal status as other Cambodians, they still seem very separate from the rest of the city. As darkness crept in, we headed back towards the centre of Phnom Penh. Neon lights illuminated the waterfront boulevard, a lively social spot in the evenings. Among the meditating monks and picnicking families, there were also plenty of people trying to make a few extra dollars. Unofficial snack vendors sold cold drinks from grubby cool boxes, children begged and we met several land mine victims trying to peddle books. Although a lot of accommodation can be found near the waterfront, we opted for a place in BKK1 to the south of the Independence Monument. This seems to be the district of choice for Phnom Penh's wealthier citizens and the ex-pat community. Brand new apartment buildings with underground parking and 24-hour security are the norm in this part of town. 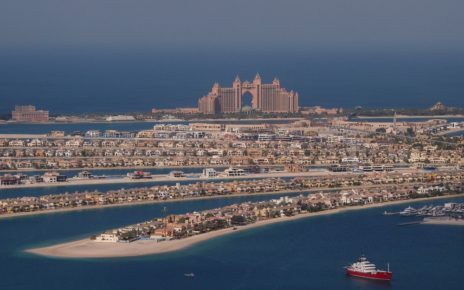 This district is home to some great restaurants and is well supplied with both local and international food. 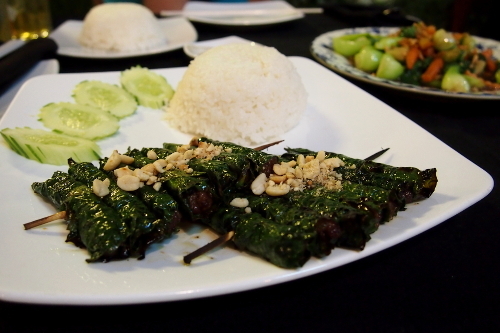 We particularly enjoyed Mok Mony, especially their marinated beef wrapped in betel leaves. The Royal Palace closes for 3 hours every lunchtime. Check the opening times before you go. 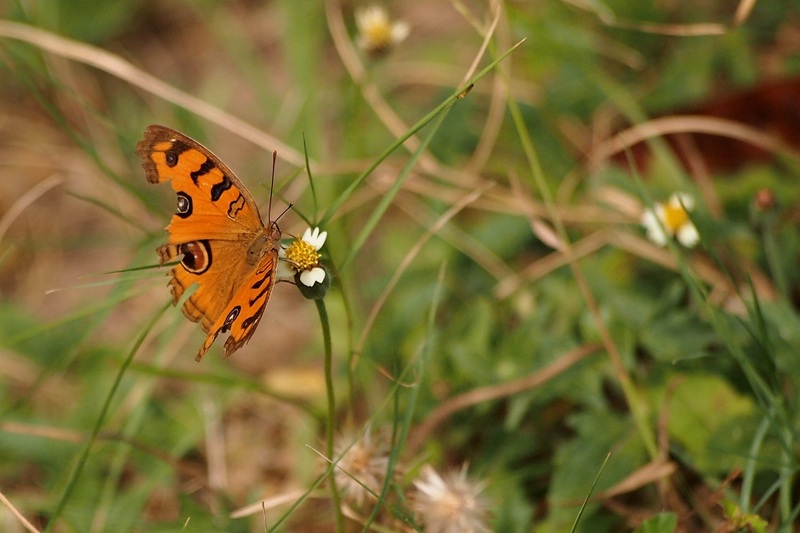 It is possible to combine a trip to S-21 Prison and the Killing Fields on the same day. Both sites are pretty harrowing however, so it's better to visit them on separate days. It's easy to book a sunset cruise online. We booked with Cambo Cruise. I am with you 100% Madeleine; what an amazing city. 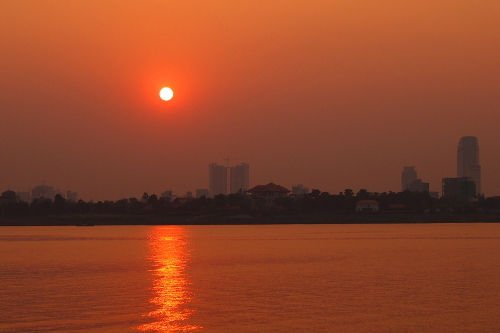 I loved my month in Phnom Penh. Thanks Ryan. Happy to hear we’re not the only ones!